Apple has rolled out iOS 9.3.4 firmware update for iOS 9.3.x running devices. Apple has entitled the update as an important security fixes and improvement for iOS 9 running devices. Just few days ago, Pangu released their iOS 9.3.3 jailbreak for iPhone and iPad devices. 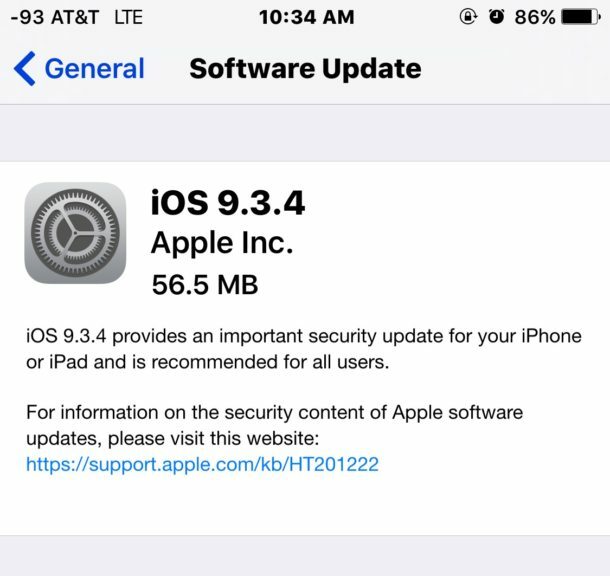 Apple says iOS 9.3.4 provides important but small security fixes to iPhone and iPad devices. Apple is recommending everyone to update their devices to latest iOS 9.3.4 firmware version. However, if you love jailbreak like us, then iOS 9.3.4 update is not for you. It will remove the jailbreak from your device, and you won’t be able to jailbreak your iPhone or iPad again on iOS 9.3.3. The update is available for everyone and you can get it right away on your device. The iOS 9.3.4 is only targeting security fixes and there is nothing new inside it. It will remove jailbreak and fix the security bugs that allowed hackers like Pangu to jailbreak iOS 9.3.3 on latest devices. Apple is also working on iOS 10 beta, and there is no update about any security fixes in it. Meaning, Pangu has used specific iOS 9.3.3 jailbreak exploit for public release and tried their best to save powerful exploits for iOS 10 jailbreak. Pangu and other jailbreak developers team are protected towards their jailbreak exploits and do not want Apple to fix them any soon. The earlier reports suggested Pangu might have burned iOS 10 jailbreak exploit by releasing the exploits for iOS 9.3.3 firmware. It is still unclear how it is going to affect the upcoming iOS 10 and iOS 10 jailbreak for general users. The process to update your device to iOS 9.3.4 is very easy. But again, you need to think about your jailbreak status. If you update your device to iOS 9.3.4 then you won’t be able to downgrade and get jailbreak iOS 9.3.3 back for your device. Apple is strict on iOS downgrading and once they stop signing specific iOS certificates there is no way to get back older iOS running on your device. You can update your iPhone, iPad or iPod touch using the below-mentioned iOS 9.3.4 IPSW download links. However, if you do not want to download iOS 9.3.4 IPSW but quickly want to update your device to latest iOS 9.3.4 then you can always use iOS Software Update utility OTA update for your iOS devices. In case if you want to update your device to iOS 9.3.4 and running iOS 9.3.3 jailbreak, then you have to use direct iOS 9.3.4 IPSW download links because jailbreak removes OTA capabilities. You cannot use the OTA update to get latest firmware on your iPhone or iPad device. You need to download iOS 9.3.4 update on your computer and restore it using iTunes. It will completely remove the jailbreak and update your device to latest firmware.